My first day in Bangkok was exactly what I wanted it to be. Actually maybe just a little bit more. I came off the airplane anxious to shake 22 hours of sitting out of my body. Oh yeah, first I had to take a taxi into the city. Then I could shake it off. A young Thai gent struck up conversation while waiting in line, so we ended up sharing a ride into the city together. I thought I’d be too tired to chat, but he only got my chatterbox warmed up. By the time I reached my friend’s apartment, I was ready to catch up on life. All of it. Brian and I stayed up for a few hours filling each other in on life’s details. He opened a dessert spot a few months ago, called Flour Shoppe, so he gave me the run down on all the happenings with that; then I filled him in on my New York life. We talked into the wee hours, totally neglecting the fact that I should be trying to get in sync with my new time zone. Jet leg here I come! After finally deciding to call the chit chat quits, I restlessly slept for a few hours. I was too eager to wake up and see Bangkok bathed in early sunshine light. I walked out of the apartment at 8am and decided to head to the train station. I made up my mind the night before that I would spend my first month in Chiang Mai studying Thai language. I’ve been several times to the North, but I can’t say I know it extremely well. Everyone raves about the sleepier pace, the cool mornings and cooler evenings, the clouds that settle low in the mountains and first and foremost how friendly everyone is. Coming from New York, I love the pace of Bangkok, horns blaring, motos whizzing and a general feeling of chaos in the air. But why not step away from that and try a more mellow version of Thailand this time? At least for the first month. So I bought my ticket and started making my way back towards Lang Suan, Brian’s neighborhood. Along the way, I decided to try a new yam lady. I’m very eager to go back to my favorite salad woman, but I want to be able to speak a little more Thai before I do so I can have a semi conversation with her. So her incredible papaya salad will have to wait until next month unfortunately. These language classes better be worth it because I’ve been craving her salad for 7 months now! This other woman didn’t disappoint. 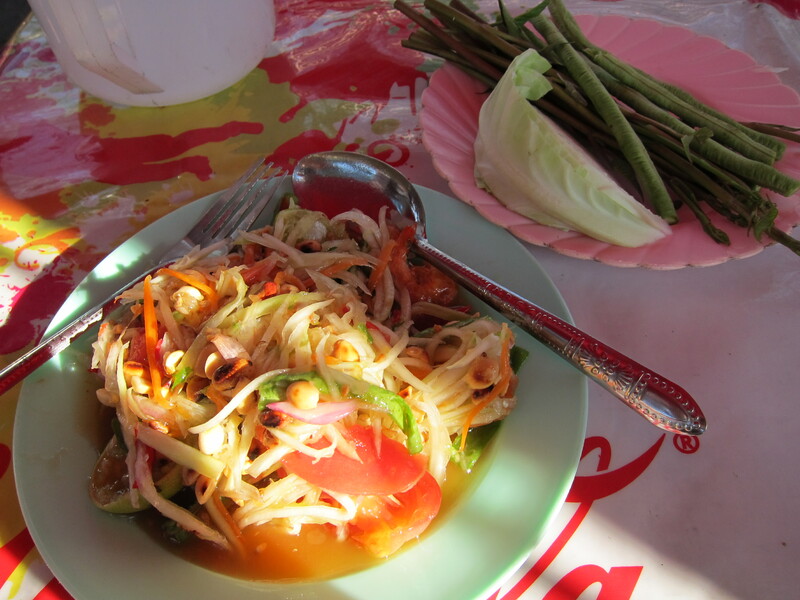 Her salad had all the characteristics of a good som tam: sweet, spicy, sour and umami (a good dosing of fish sauce). 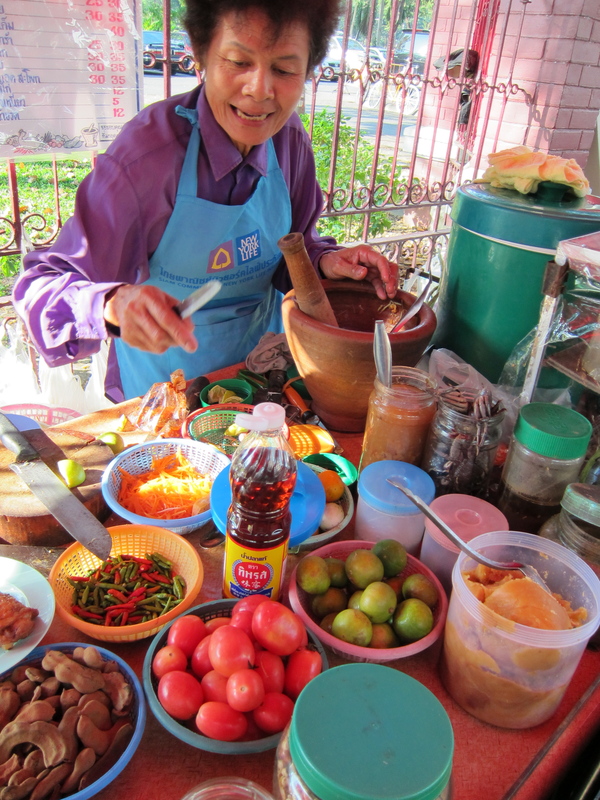 It just didn’t have the same finesse, nor quality of ingredients, that my favorite papaya salad lady adds to hers. Never mind, because really I was just happy to be walking around Bangkok, in a summer dress and eating something so spicy it made my eyes water. That’s all I really want out of life. 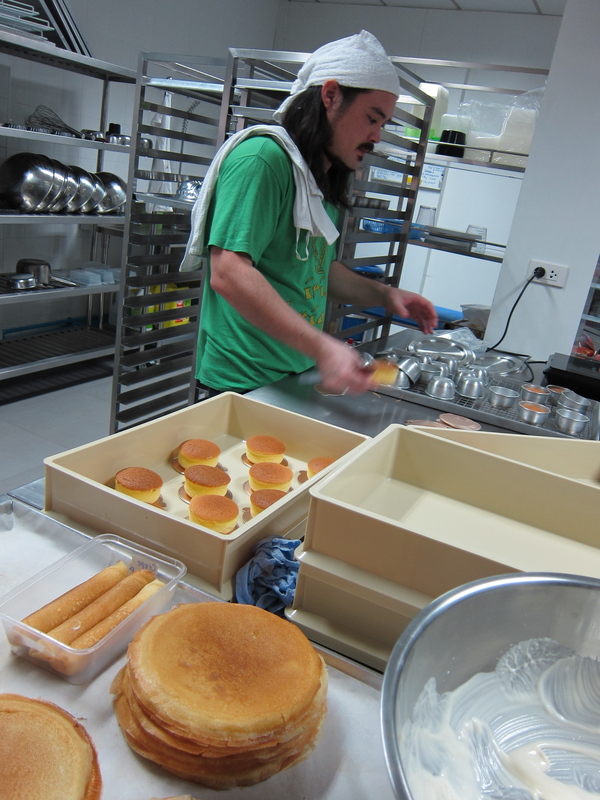 During the day, Brian and I hung out in his bakery kitchen, he doing most of the cooking while I watched and tasted. 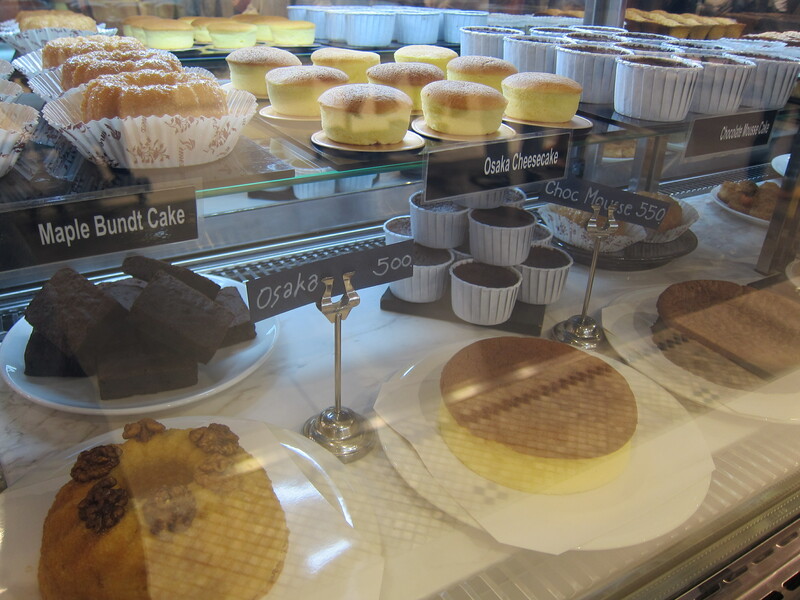 After a full day of pulling Japanese cheesecakes in and out of the ovens, reading Christina Tosi’s Milk Bar cookbook front to back and sampling several of Brian’s new dessert ideas, we made our way to Lad Phrao Central to where the actually Shoppe is. When I met Brian, he was in the recipe development stage of his restaurant. Nothing had even been built yet. So stepping into his bakery took my breath away. He had told me his ideas for the look and feel of the project, and had told me all the problems faced along the creative route– from the light fixtures to the music, down to the wrong color tiles of the flooring. But the place looked great: warm, charming and hip all at once. A glass case displayed his beautiful desserts while mix and matched furniture provided easy lounging for the sweet-toothed clientele. 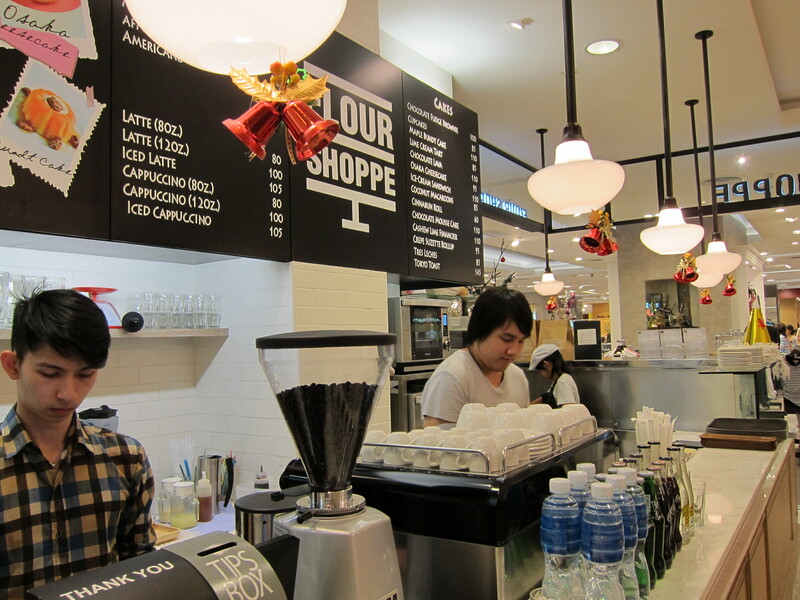 It was very fun to see his ideas and dreams built into a sweet sweets café. After sipping a caffeinated beverage we made our way over to my old neighborhood where my friend Jason lives. It felt like I had just left yesterday. We walked past all the same vendors, my favorite 7-11 and even the same mean dog that barks at me every time I pass by. Every single bit of it felt good and familiar. And then everything got fantastically better. We ate dinner at the corner restaurant where Isaan food is served. Suan Ploo soi 3. If you need an excuse to come half way around the world, this one is damned near the top of the list. Our party of six sat down and ordered massive amounts of food, many of the dishes in duplicates and triplicates. The ladies who prepare the dishes are some of the most amazing cooks you’ve ever seen. Working over one gas burner and two mortar and pestles, these ladies pump out a mean service. 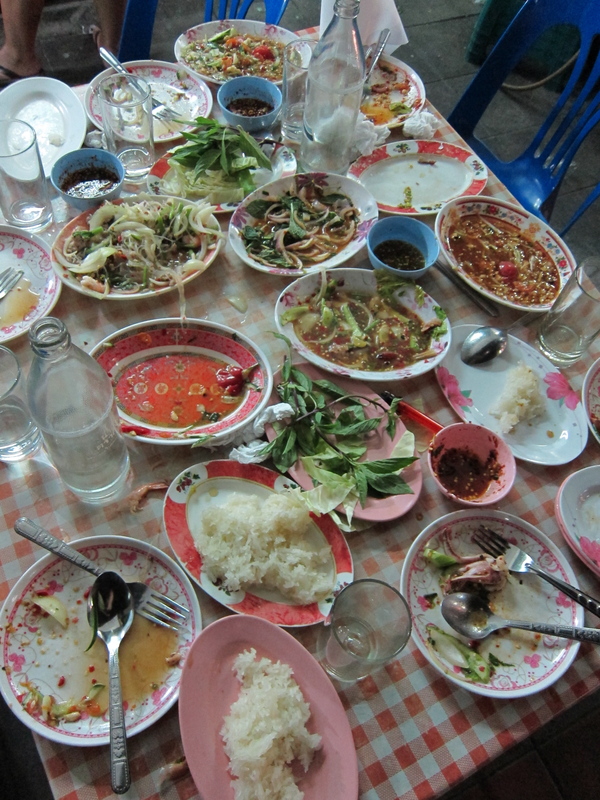 We ordered pork neck, pork neck salad, cucumber salad, seafood and mung bean noodle salad, squid laab, sticky rice, papaya salad and a few Leo’s to wash it all down with. The pork neck is the most incredible protein you can imagine. Marinated in fish sauce, sugar, aromatics and apparently milk (Jason said so!) for eight hours, and then grilled in ceramic tandoor-like ovens, it’s perhaps one of the more transcendental yet simple dishes you can eat. Sweet, smoky, tender and fatty it’s great on its own or tossed in a salad. The dishes kept coming and we kept having to combine and shuffle to make room. A dance between how fast we could eat and how fast the kitchen could keep it coming. We held up pretty well to the women’s fierce pace and ended up devouring most everything we had ordered. Isaan food will make your cry. Not only because it’s so incredibly delicious but because it’s also ridiculously spicy. The ladies won’t tone it down because you’re a honky white kid. You’re going to get it just as spicy as the table next to you (that is, unless you want to be a wussy and ask for it less spicy. Don’t be a wussy). 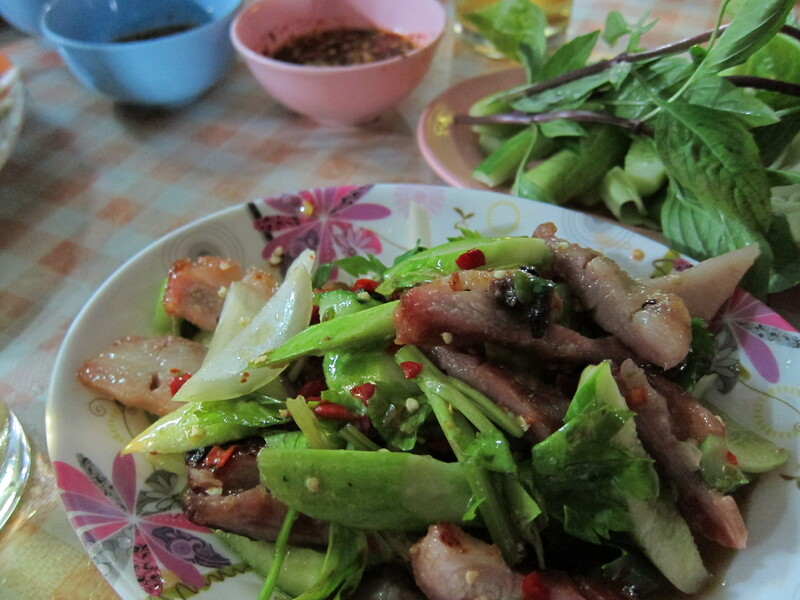 It’s worth enduring the heat to get the full affects of the food (a.k.a spicy food high). We sweated our way through every last bite, leaving only a few bits and nibbles for the kitties to clean up. Bellies full and completely satisfied, we figured why stop there? We crossed the street and made our way to the mandatory meal finisher: the ice cream vendor. The desserts in Thailand are no joke. No matter how full you are after a meal, you need to find room to put a little sweet into your life. We sat down on some stools and soon a cluster of tiny metal bowls arrived at our table. 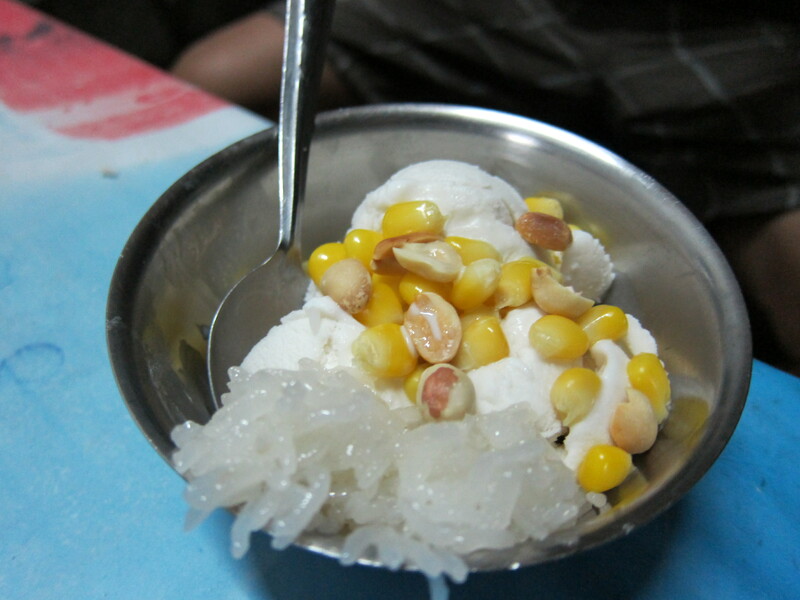 Vanilla ice cream doused in coconut milk and littered with peanuts, corn and sweet and salty sticky rice only lasted seconds before we were tilting the last drips into our mouths. This concoction is also pretty great on a thick slice of the whitest of white bread. 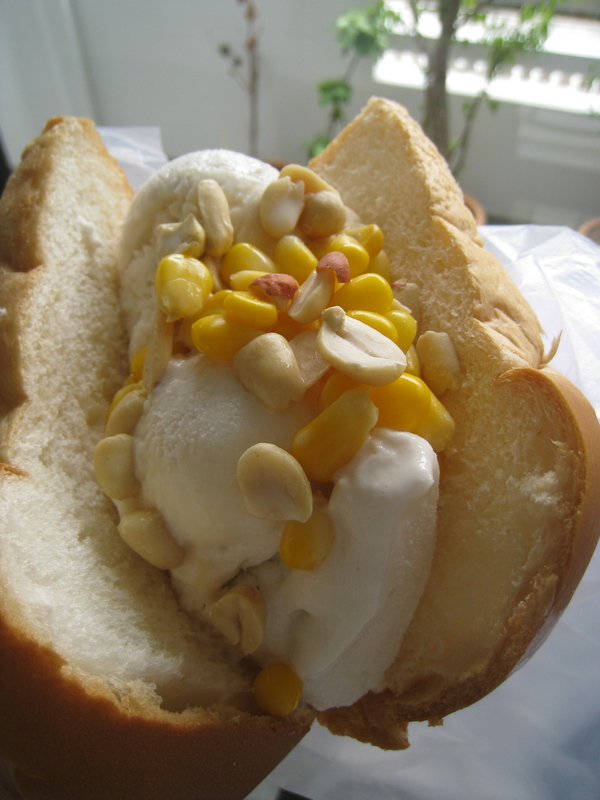 It’s the Thai version’s ice cream sandwich. No joke. But we were too full to go with the carbohydrate edition so we just went for the goods. If you’ve got the appetite, try this. 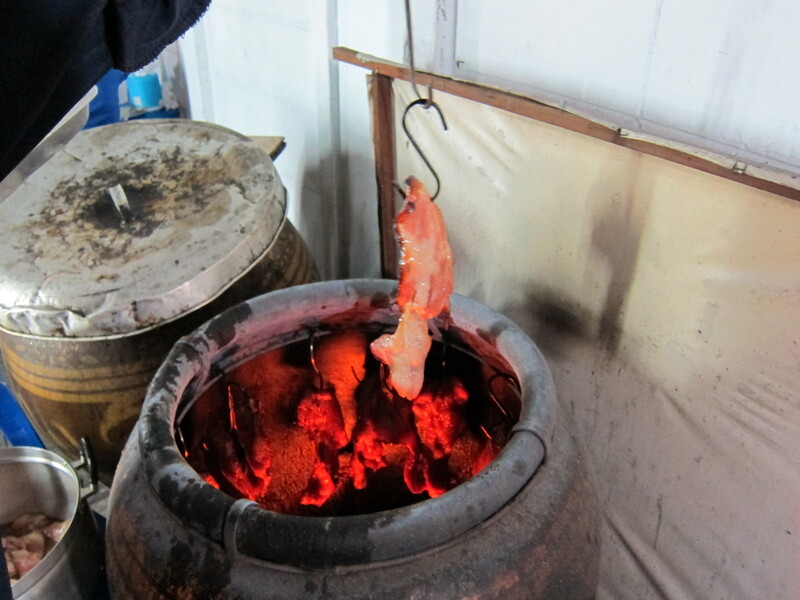 The Thais have incorporated the same elements into dessert as they have into savory dishes. Salt compliments sweet, while chew and crunch are always being considered. Texture and variety are what makes Thai food so interesting and dessert gets the exact same treatment as the main course. Next Post Dancing Shrimp Video! I am having so much fun enjoying the world through your eyes as I know I will never make it to the places you have been/are going. Pics are looking really nice, can’t wait to see more. I want. All of it. Claire, I’m going to be in Chaing Mai at the end of February. I’d love to take a cooking class while I’m there (I understand the classes start with a trip to the market). If you have any suggestions for a class or places to eat I’d appreciate it.